Being a weekend woodworker (some evenings too) my time is important. Most of the joinery I’ve done is the basic stuff.. Biscuits, dadoes, M&T and pocket hole. 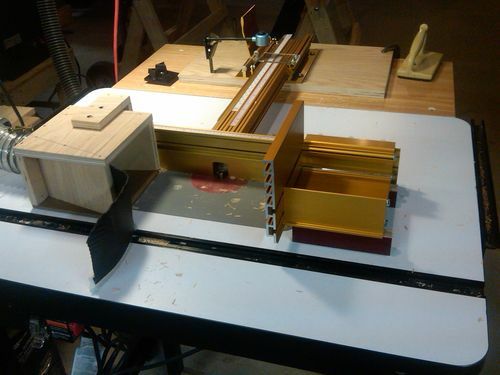 I wanted a system to make some nice jewelry boxes for my grandchildren and step up my work a notch without spending a ton of money on a bunch of dovetail jigs, and making a bunch of box joint jigs that take up room in the shop. The Incra system interested me. I watched the videos and thought the concept was interesting from an engineering standpoint. Most of the reviews here on LJ’s were positive about the Incra systems. I have an Incra miter gauge that is fantastic, so I waited for a sale and pulled the trigger on this entry level system. A couple months ago I was in WoodCraft to pickup a drum sander I ordered and saw a Jessem Router table and Fence floor model on sale for $100 off. I figured since I drove three hours, why not upgrade the router table. 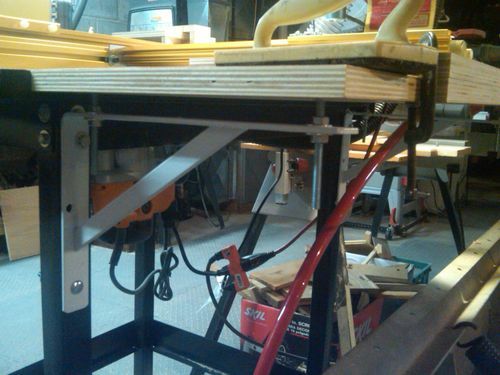 The extension table stands on four bolts counter-sunk into the table allowing me to fine tune the extension level with the router table. The board that the Incra sets on has a lip screwed into the bottom that runs the entire length of the back of the board so all I have to do is set it down and attach two small “C” clamps. I would recommend watching the videos and reading the manual before starting to get the concept of centering the bit and adjusting the bit height. I also purchased the large book of templates (well worth the price) and their instructional video. The people at Incra were a pleasure to deal with. I highly recommend this system for those who want to make great joinery without a whole lot of skill and time. I will always appreciate the hand cut dovetails but that is way in the future for me. This little Incra was intended for joinery, I use the beefy Jessem fence for most of the router work since the DC works great and the face adjusts for different size bits. I can use the Incra fence for precise work if needed. If you don’t want to spend the money for the full Incra Setup, this is a good add-on. the veritas dovetail guide for a hand saw is awesome if you want to gut dovetails. its like 40 bucks and instructions are great. don’t buy the saw that comes with it though, its small and the teeth are way to finely set to make fast work of cutting them. i use a bear saw ( japanese saw, from home depot) with i think 14tpi rip and 22tpi crosscut, the 14 is great for cutting it. 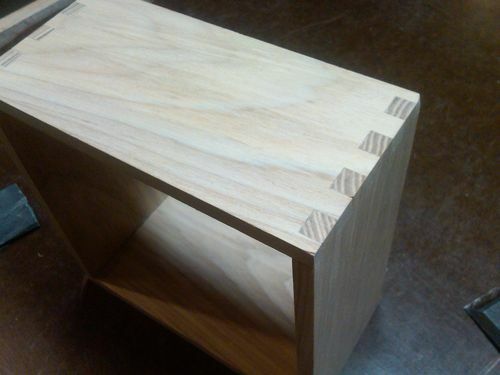 ya just need some good chisels and there you go dovetails. Thanks for the good review, and congrats on the new router table. You’ll find that the dust collection hook up on the Triton router will be quite good for the time you use the Incra Fence. Since you bought the template kit, don’t be surprised if you find yourself using the Incra fence for a LOT of things. With a shop made slide in sacrificial fence added to the Incra, it’s amazing what joinery and other stuff you can do. Enjoy the new tool! I have an Incra LS-25 and I don’t think you can beat it. I have three other methods of cutting DT’s that are gathering dust. I really like my Incra LS system…I have the full blown system which I got a super package deal on with a Incra offset table. I now have a Porter Cable Omijig that is collecting dust….I will have to put it on Craigs List or such as I do not see me using it after becoming used to the Incra system. The Incra has its foibles though….one is that you really have to pay attention to the hairline marker on the positioner to insure it is on the right setting (you have to make sure you are looking at it direct on or you will end up on the wrong number with ill fitting joints)...and you need to make sure that the templates don’t slide in their slots while you are moving the positioner….I have taken to taping them once I have centered the system. Excellent review by the way….you will really like that tool….it is also very good for setting up other items on the router table (I use it alot for making M&T’s).....and the positioner is great for making incremental passes. I know what you mean about the hairline. I noticed (and forgot to mention) that if you have a shop light that is not directly over the hairline, you get a shadow thrown by the hairline onto the jig. That’s why (if you look at the photos) I have added an inexpensive LED booklight which shines directly over the hairline and eliminates the shadow. In fact it throws it’s own shadow directly below the hairline. Works great and I never miss the mark. Before I added the booklight I got a little hasty and missed the mark then had to work the joint a little to make it fit. Now with the light, no issues. I also made a dust collection box with a small bar that fits over the fence and rides with it. I just remove the Jessem fence and DC hose, connect it to the small DC box and it’s ready to go. 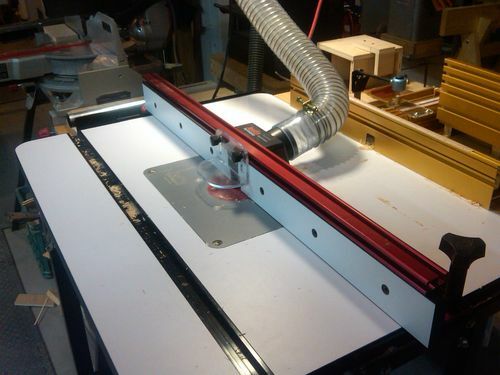 I am waiting for another sale and some cash to purchase the TS-LS system for my table saw. I’m going to have to move some things around however to allow the extra room needed to the left of the table. The fence they shipped me was actually a shorter version of their standard fence for the LS systems. It can accept the upgraded stop and the wonder fence. The directions that shipped were for the older style fence, but I am not complaining with the better fence.